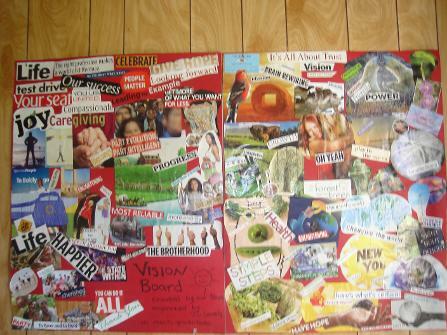 Very Special Offer, Defining your Vision with a Vision Board is only $30 per person this month. Group and evening sessions also available at this rate before the end of the month. Let the arrival of Spring be the time when you plant the seeds for the rest of your year and beyond. Move forward with a clear vision of what you want to see and feel and be during the coming months. Begin a practice that will open Cosmic flow, and allow it to reach you. You will create a Vision Board to take home with you. Placing pictures on a Vision Board is a little like naming a destination as you settle behind the wheel of your car. Before ever turning the ignition key, it is good to know where you would like to get to. Imagine that you get into your car today in Nova Scotia's Annapolis Valley, with a plan to get to Halifax. coffee, or which are your favourite comfort stops. You know that Halifax is accessible by car, and you can set out with confidence. caused a hazard and it makes more sense to head south and approach the city from the west instead of the north. You are clear about your destination. It remains unchanged, and perhaps you enjoy the drive more than you might have done otherwise. Maybe this is an unexpected opportunity to visit a shop you have heard about, or enjoy a cup of tea with a rarely-seen friend. When you reach your objective, it is as you intended, and your day may have been enriched by the unexpected aspects of the trip. Imagine though, if you had no destination, or only a dreamy idea of where you might like to go. What if you got into your car planning to just get through this kilometer? might be ten times as big as the initial 1 kilometer goal. That is disheartening. That is overwhelming. That may even be a reason to give up and go home. or perhaps, eventually, you would reach your objective. It would have been a journey fraught with not knowing, with difficulty and even fear. For many of us, our approach to all of life is about ‘getting through the day' – or week or pay-period. Some of us just want to make it through until after a stressful committee meeting, or when the grandchildren go home, or until we can’t be in the garden every day. We make a plan to delay any thought of what might be possible a little further along in life. There is no goal, no target, and no vision. We have not looked within to find what we believe our purpose to be. the highway is a chance to enjoy the scenic surroundings we so often take for granted. All is well with the world. 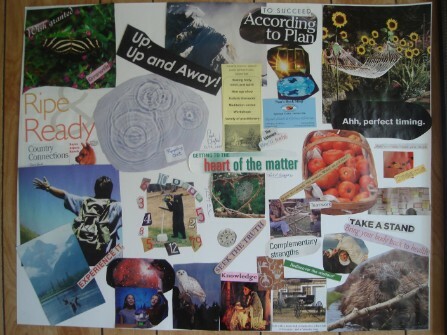 A vision board is a wonderful way to remind ourselves of where we are going, even when we are not at all certain how we might get there. I put an image of two people on a board in the spring of 2009. It was a wish to spend more happy time with some specific family members, people I love. They live and work near Ottawa. At that time I lived in the Annapolis Valley on Nova Scotia. I had no idea how “more time with them” could possibly happen, and I did not invest any energy looking at whether I wanted to go to see them, or I wanted them to drive to see me. I had no idea how to make it work, I simply put out the idea that having me with them, more laughter and fun with them was a place I wanted to reach. Within weeks I received a phone call. They were planning a road trip, would I like to come along? Thank you. Universe, that works just fine.